I went to Finland at the beginning of July for a big family party with some friends and a few days R&R. Whilst there, our good friend Lauri asked me what was happening to the blog, why wasn’t I posting much at the time. I found it hard to answer his question and perhaps I was actually finding it difficult to admit to my own laziness. His voice has been ringing in my ear ever since, so this one’s dedicated to him, for making me aware of my shortcomings and being a friendly conscience. The truth of the matter is that it has been hard to dig myself out of a period of creative block and a time full of big distractions. So where are we with things? Well, that old helmet I mentioned in the last post is now primed in white and ready to take a design as soon as I’ve finalised what it will be. The sketch above will give you a fair idea of where I’m going with this. 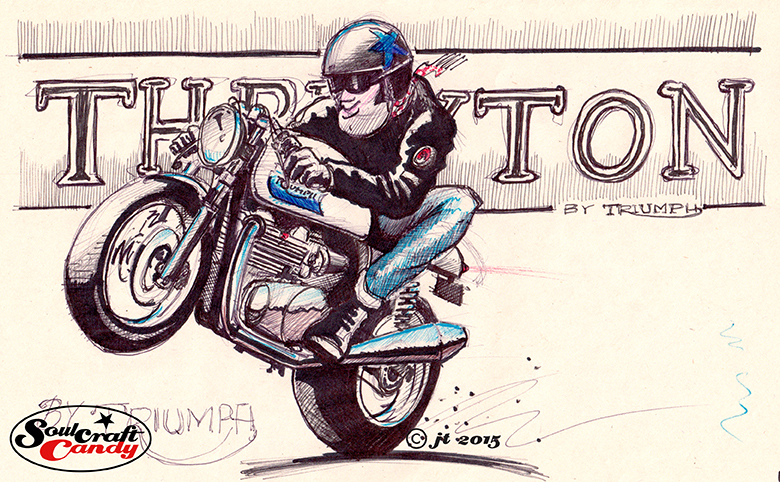 The main thrust of the idea, if you can call it that, is a kind of homage to cafe racers of old, those young men who started it all off all those years ago and the places they frequented in pursuit of their thrills. This is something that is geographically close to me as much as having a strong emotional pull. Firstly I live in west London not far from that bastion of British motorcycling heritage, The Ace Cafe, and a particular stretch of highway called The North Circular Road. These two features lie at the heart of the original cafe racing scene of the early sixties. That’s the main bit. The second part is due to the Rolling Stones and the opening track on an old vinyl album I have of theirs which is a fantastic rendition of Route 66, the classic R&B standard written by, and originally recorded in 1946 by Bobby Troup. I absolutely love this track, and what ties it to my homage project is that the North Circular Road is actually the A406 in the english road numbering system, so it’s not a giant leap to end up with “get your kicks on the A406”. So, as you can see, we’ve got a small group of likely lads doing just that on the front of the helmet. What goes on the back will undoubtedly contain the above modified chorus and then I think, various references to the road and the famous cafe that still occupies its original site. 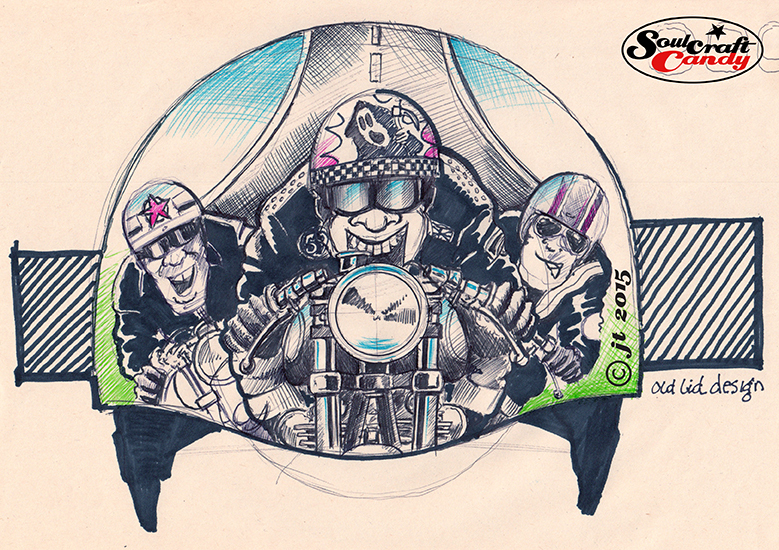 This entry was posted in Bike drawing, Cafe Racers, Creativity, Drawing, Helmet Design and tagged Bike drawings, Cafe Racer art, Cafe Racer cartoon, Cafe Racers, Cartoon bike, Helmet Design by Soulcraftcandyman. Bookmark the permalink.